The first time “Carrion Luggage” saw print was back in 2003 in Island Dreams: Montreal Writers of the Fantastic. It was a short story I wrote concerning a voodoo curse making its way through airport security. As such, it was already a nostalgic look back at the kinder, gentler days of airport security when there was still some small measure of dignity in flying. As early as 2003, the act was already turning into a body-scanning, cavity-searching, beverage-free zone of bodily violations by grabby rubber-gloved “agents” with less training than your average grocery store checkout bagger and worse judgement than a mall cop chasing after teenagers for harassing an anchor-store Santa on Black Friday. Despite a certain dated quality, the story sold again in 2014 to Black Chaos: Tales of the Zombie. My thinking there was that the announced anthology would be inundated by contemporary flesh-eating zombie stories and that there would be no love for the ironically underexploited voodoo zombies of old. I was quite right and they agreed to the reprint. Additional publishing details and links can be had on the Anthologies page. As those of you who have bought and/or read my recent collection of Red Baron articles will know, I’m doing a slow roll-out of some of my material, new and old, for Amazon Kindle. 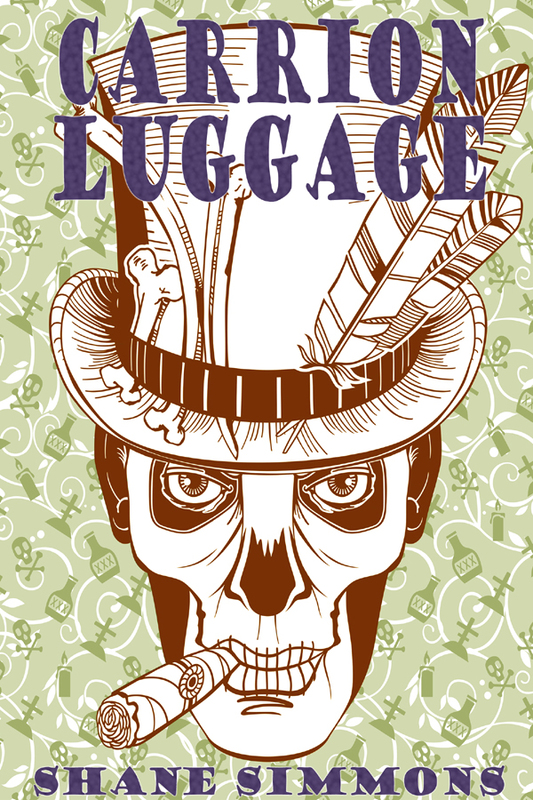 Publishing “Carrion Luggage” as an eBook is my second official trial balloon. It’s now available online for $0.99 – or whatever weird one-cent incremental variation Amazon seems to randomly apply to these things. When I say “second trial balloon,” that’s a bit of a lie. There have been others, but this is only the second publicly announced one. I’ve been busy learning all sorts of new and mind-expanding things about digital publishing as I gear up for bigger and loftier projects. The handful of fiction I’ll be making available in the coming month(s) is my way of cautiously learning the ropes as I weigh the dubious returns and glacial pace of traditional publishing versus the dubious returns and fast pace of do-it-yourself eBook publishing. Investing a buck per story would be a fairly token but much appreciated way for you to show me my time is not being spent in vain. Think of me as a sort of literary busker – except I’m not getting in your way in the subway and assaulting your ears with terrible covers of Simon and Garfunkel songs on my Casio keyboard. Related to all things publishing, this article about the often terrible terms writers are expected to sign their name to is worth a look for those interested. I mostly include the link here as a means of bookmarking it for myself. At some point down the line, I should create a blog post about the most egregious things I’ve seen recently in various terms and conditions clauses – often from little- to no-pay small presses that are already asking writers to bend over for free. The web has levelled the publishing playing field in recent years. It’s the wild west out there, and just like the wild west, few people panning for gold are finding any nuggets. I am (along with everybody else) trying to figure out what the new business model is going forward. The more I learn, the more I’m concerned there is no more business model. Or worse, there is a business model, but it’s broken and dead – just like the prospector’s horse that keeled over and died rather than carry all that mining equipment up the mountain one more time.